CHITWAN, Feb 1: The earthquake of April 2015 had killed one and injured many in Guchhiwang village. None of the houses survived the disaster. Though some of them were partially damaged, most of the houses were fully damaged. The administration brought the villagers to safer land in Jutpani as the quake and the aftershocks cracked most of the village land. “We rushed to the plains in Jutpani after the land and hills opened up wide cracks. It was too dangerous to live in the fragile hills,” reminisced Gopi BK. “At that time, survival was the biggest question. We had to find an instant option, we all left village and came to Jutpani, as the administration guided us,” he added. The victims started living in makeshift huts in Jutpani. Days and months passed, they continued living there. In summer and winter, they are severely affected by extreme weather conditions. Since they don't have sufficient cloths and means, most of their lives are not easy. Yet, they don't have a choice other than to live there. “We would definitely feel better if we could be relocated to some better locations. But who would do that for us? So, we are not going anywhere else,” BK said. It is not that BK has forgotten his village. He says that he loves to go there. But, he is not convinced that the village is safe to build house and settle down, anymore. 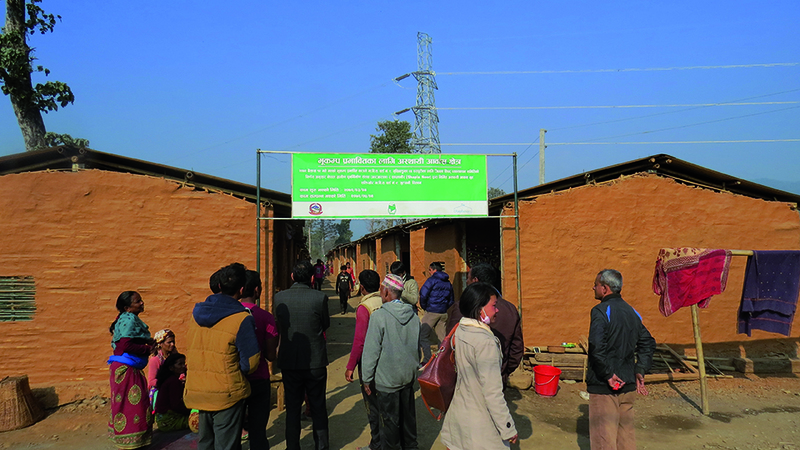 Because of their reluctance to return to their village and build houses, many of them have not claimed the housing grant, meant for earthquake victims. “The quake cracked our land and even affected the integrity of the hill. We cannot go back there and build house on a fragile hill. It's simply unthinkable,” he asserted. The government provides Rs 50,000 as the first installment of house grant, while the total grant is set for Rs 300,000. Quake victims in other areas have asked the government to provide them the total amount at once, if possible. They say doing so cuts down their cost of building home as prolonged wait for the installments lengthens the construction process. But since the victims of Guchhiwang village are not willing to go back to their village, they have no land outside their village to build house. Without it, they do not qualify for the grant. “Since we don't want to build our new house in the village and since we do not own the land here, we have not requested for the housing grant. We don't have a safe piece of land to build our home,” said BK. Guchhiwang village is located on the top of a hill that is nearly one-day drive from Bharatpur district headquarters. In lack of transportation facility there, many locals still rely on their own foot for the journey. “We are from a very remote village. Even though road tracks have opened, they are just namesake. We have to walk miles to get there,” BK informed. Jutpani is not that a privileged location either. But in terms of distance, it is just 12 kilometers from Bharatpur. And this has increased their access to a lots of facilities, otherwise inaccessible in their native town. Locals at Jutpani state that these quake victims might not be willing to return not only because their village still looks fragile to them, but also because they have realized how remote their native village is. However, BK stated that the remoteness is not the problem. “There are many problems. One of them is scarcity of drinking water. The water sources, which we relied on has dried. How can we build settlement where you don't have drinking water?” he questioned. Though six families from the village have received the house installment, they said that they too also not used the money. “We took Rs 50,000 from the government. But we have not done anything with it,” said Mati Ram BK. “I have kept it safe. Other villagers say it is not safe to build house back in village,” he added. Rajendra Karki, Chief of Chitwan District Coordination Committee of National Reconstruction Authority informed that the resettlement in Guchhiwang is safe. He said that experts had properly examined the village and found it to be safe. “There is no danger in living there. The villagers can return and start rebuilding their houses,” he said. “Since some of the have received housing grant by showing land ownership certificate of their land in village, they are supposed to return and build their houses,” he added. According to Karki, their relocation to the Jutpani was a temporary management and the villagers should be willing to return home.